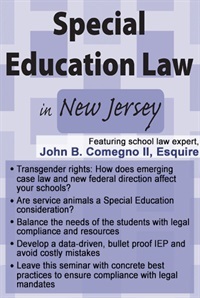 John B. Comegno II, Esquire, founder and president of the Comegno Law Group, P.C., is recognized as a leading school law practitioner, representing public and independent schools through the Northeast region. 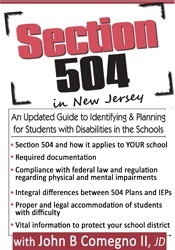 He is a member of the bars of the State of New Jersey and the Commonwealth of Pennsylvania, and has litigated special education disputes across the United States. He lectures to professional groups throughout the region and regularly appears as a keynote speaker for national groups across the country. 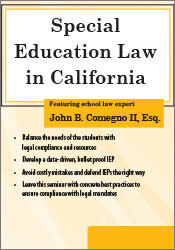 Mr. Comegno also has extensive experience in handling general, day-to-day student issues. These range from compulsory education, student safety and disciplinary incidents, to constitutional concerns involving free speech and religious expression. In addition to handling union negotiations, Mr. Comegno is involved in a variety of labor and employment issues including confidentiality and reporting requirements for teachers and staff and sexual harassment in the school setting, including teacher-to-teacher, teacher-to-student and student-to-student harassment. Drawing from hundreds of lectures to thousands of educational practitioners across the country, John’s lectures are equal parts legal/practical guidance and humor, wit and entertainment. Attendees regularly follow John’s lectures on an annual basis and report that his lecture style not only well-informs but also engages and entertains.